Christian Liberty Academy pastor and teacher Calvin Lindstrom at Chick-fil-A for lunch on Wednesday. After the mayors of Chicago and Boston criticized Chick-fil-A for COO Dan Cathy’s stance against gay marriage on the Ken Coleman radio show, and Chicago Mayor Rahm Emanuel went so far to say that the company does not reflect the City of Chicago’s values; a backlash against the Georgia-based chicken restaurant grew among gay activist, and gay activist vegetarians. Conservatives and supporters of free speech, led by former Arkansas Gov. Mike Huckabee, formed a sort of backlash to the backlash — a sort of inverted boycott. In Schaumburg there were no ministers preaching about “the perversion of homosexuality” and there was no hate expressed against gays; just people celebrating free speech and democracy in action, and capitalism in action. And the enjoyment of chicken and side dishes. The watchdog group Gay & Lesbian Alliance Against Defamation (GLAAD) has been in existence for over 25 years and claims to have worked with news, entertainment and social media to bring culture-changing stories of LGBT people into millions of homes and workplaces every day. In a blog post titled MORE THAN JUST MARRIAGE, CHICK-FIL-A IS ANTI-GAY: FACTS FOR MEDIA COVERING CHICK-FIL-A, Aaron McQuade writes that media reports have not asked some critical questions, and “have presented incomplete or incorrect stories to audiences.” GLAAD claims “they (Chick-fil-A) have given millions of dollars to anti-LGBT organizations, including those that have been designated hate groups’ by the Southern Poverty Law Center. GLAAD claims “they support groups that push so-called ‘ex-gay’ therapy,” which GLAAD argues is not supported by the American Psychological Association — citing an APA Policy Statement Resolution on Appropriate Affirmative Responses to Sexual Orientation Distress and Change Efforts. — GLAAD President Herndon Graddick. On the Gay & Lesbian Alliance Against Defamation (GLAAD) blog are instructions for journalists: “How should journalists report statements by Chick-fil-A supporters who say the company is merely espousing Christian values?” The blog advises it would be appropriate for journalists to seek out voices of faith who support the LGBT community to add context — adding there are hundreds of thousands of faithful, devout Christian Americans who would disagree with the idea that being anti-gay is a Christian value. Aaron McQuade, Director of News and Field Media at GLAAD, says Dan Cathy does have the right to free speech, but comments have consequences. On August 1, 2012 Chick-fil-A did not see a dip in sales — more like a giant bulge in sales. So did the media fail to carry GLAAD’s message, or are people tired of being the battle fodder for “he said, she said” conflicts, such as the recent controversy between GLAAD and Chick-fil-A. 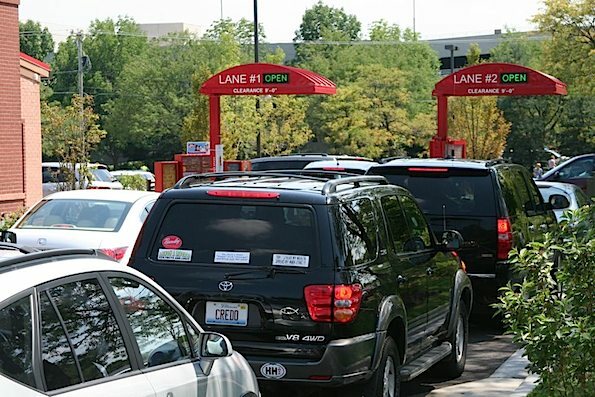 Drive-thru lanes efficiently open at Chick-fil-A in Schaumburg (See more than 400 more photos on Facebook.com/ArlingtonCardinal). Chick-fil-A national and local management made it clear that they have nothing to do with Gov. 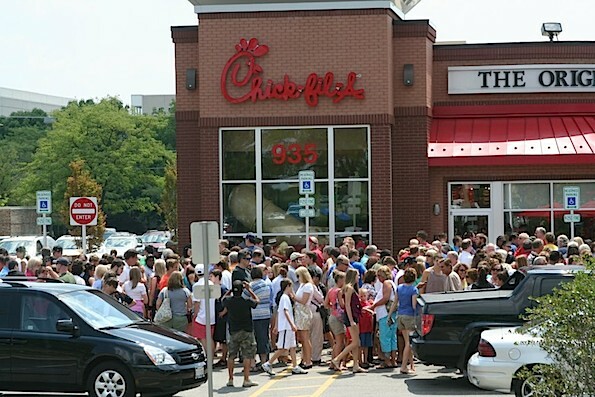 Huckabee’s Chick-fil-A appreciation day. At Schaumburg, they didn’t allow any photographers on their property. The message on the street in Schaumburg from Chick-fil-A’s customers was that they don’t oppose gay people, but they draw the line when they perceive free speech threatened. And they especially dislike the idea of government telling them what their values should be — referring to Rahm Emanuel’s statement that Chick-Fil-A’s did not represent Chicago’s values. There was also the obvious underlying tone that Chick-fil-A sells good food, and they don’t care about the opinion of a company executive. All day there was a good-spirited mood outside the restaurant, which many customers found funny, considering they were waiting up to two hours for a fast food meal. Crowd in front of Chick-fil-A enjoying a long wait for fast food (See more than 400 more photos on Facebook.com/ArlingtonCardinal). The Schaumburg Chick-fil-A restaurant served meals past closing time at 10:00 p.m. — fulfilling the long line of standing supporters that remained in front of the location. Police closed the drive-thru about 8:30 p.m., but walk-in customers continued to be served. Earlier in the day police called extra traffic and crowd control detail — closing a right lane of eastbound Golf Road so that traffic could form a line at Commons Drive and American Lane into the south entrance to Chick-fil-A. Chick-fil-A staff and police reported no problems with any individuals. One medical problem brought Schaumburg firefighter/paramedics to Chick-fil-A during the late afternoon, but the customer apparently ‘toughed it out’ because the ambulance left with an empty gurney.